Some of you may have seen pictures last week of my girls all dressed up with my husband….they were getting ready to go to their Father Daughter Dance. Yes, he has a lot of girls to dance with! We have been blessed with many girls! Anyway…we actually hosted the dance. Yes, it’s true. There was actually a dance a few weeks ago, but they had to miss it because some of them were sick. Turned out that some of their friends weren’t able to to either for various reasons so we decided to host our own! They had a blast and asked if we could do it every year…not sure about that one. But I am so glad they didn’t have to miss out on the fun with their dad and their friends. 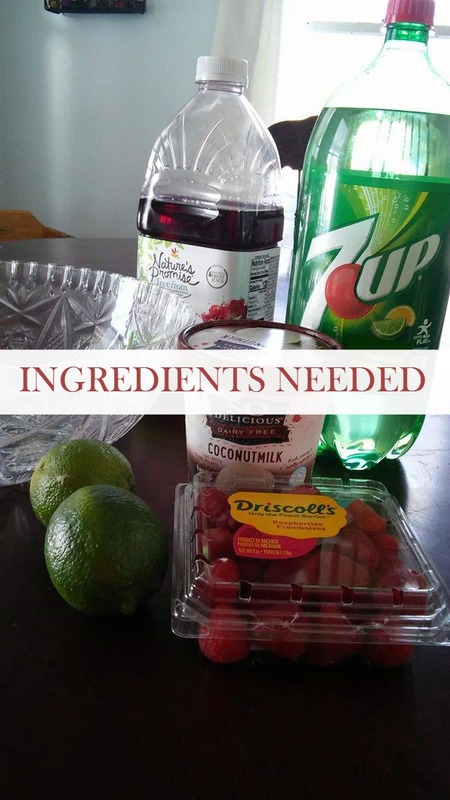 I was recently asked by 7UP to create some unique recipes and I thought this was the perfect time to do so… 7UP is one of those beverages that is so versatile – it’s easy to come up with a million ideas using it. We have used 7UP in the past for different drink recipes, and have even used it to make popsicles! Because we have some food allergies in our house, I had to be creative when it came to the punch recipe. This may sound a bit strange but I promise you it was delicious and refreshing, even in the winter. I am not exactly the measuring kind when it comes to recipes, but I will tell you what we did and you can tweak the recipe if necessary. Keep in mind this recipe served about 15 people and is dairy and gluten free. This is not an exact science! I used everything in the ingredient list and it turned out wonderfully. You could use more or less depending on how many people you are serving. 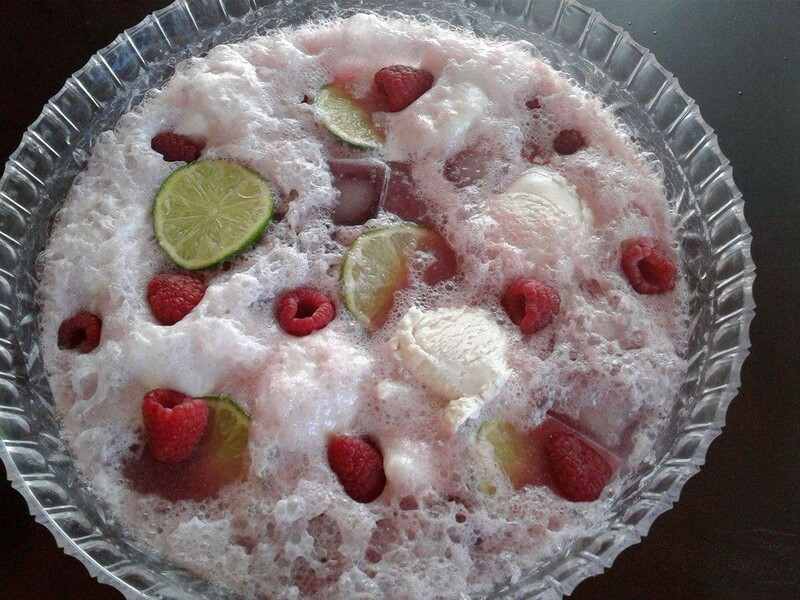 Scoop the ice cream into the punch bowl first, then add as much ice as you want, then add your fruit and juice. Pour 7UP over all of it. That’s it! Super simple, looks beautiful and could be used again and again for different events. Bonus tip for you – Make sure to check out Savory Magazine in the “New Flavors” edition until 3/30 to save $1.00 when you buy two 7UP® 2-Liters. What do you think? 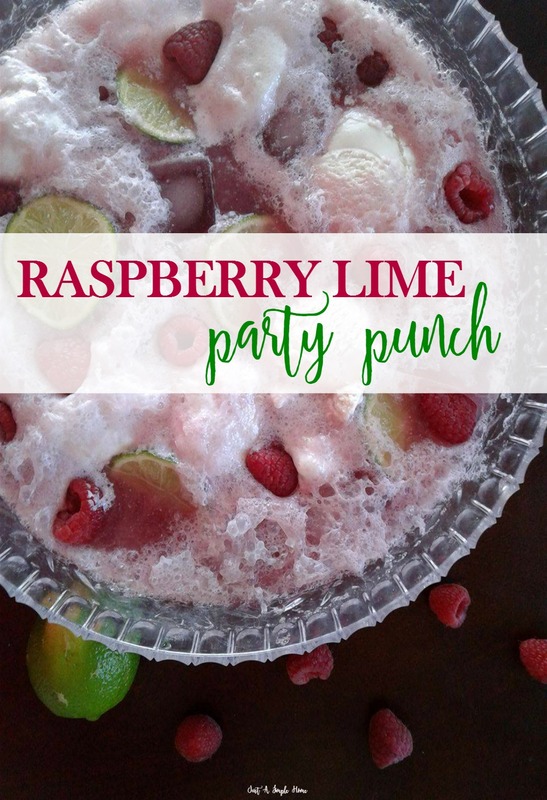 You could easily suit this to suit your family if raspberry and lime isn’t your thing. We almost went with fresh pineapple instead of lime, but I had a few girls who were begging for the green color of the lime. It was a special night, so lime it was! They had such a good time and raved about the food and drinks almost as much as the dancing. Do you have any other great punch recipes to share? What a fun recipe! We will have to try this at an upcoming birthday party! This sounds really yummy. I’m a huge fan of mixing 7up with about any flavor. Right now my favorite is 7up and lemonade mixed together though! This looks really great! I love a good lunch recipe.